Drain and rinse the haricot beans, then tip into a medium saucepan and add fresh water to cover. Bring to the boil and cook for 10 minutes, then lower the heat, cover and simmer for about an hour or until the beans are just tender. Drain and set aside (see tip). Heat the oven to 120°C/100°C fan/gas ½. Cut the bacon into 4cm cubes (or 4cm strips if using bacon slices). Put a large heavy-based flameproof casserole (one with a lid) over a medium-high heat. Add the oil or lard, then the bacon and cook on all sides for 4-5 minutes until caramelised and golden. Remove the bacon and set aside on a plate. Slice the squid bodies into 1-2cm rounds and the tentacles into several pieces. Drop the squid into the casserole and cook for 3-4 minutes until brown all over. Remove the squid and set aside with the bacon, then lower the heat under the casserole to medium. Add the onion, garlic, thyme, bay leaves and lemon zest to the casserole and cook, stirring often, for 6-8 minutes until the onions start to soften. (if it is, add a splash more water). After the allotted time, take a piece of bacon out to test; it should be fall-apart tender. 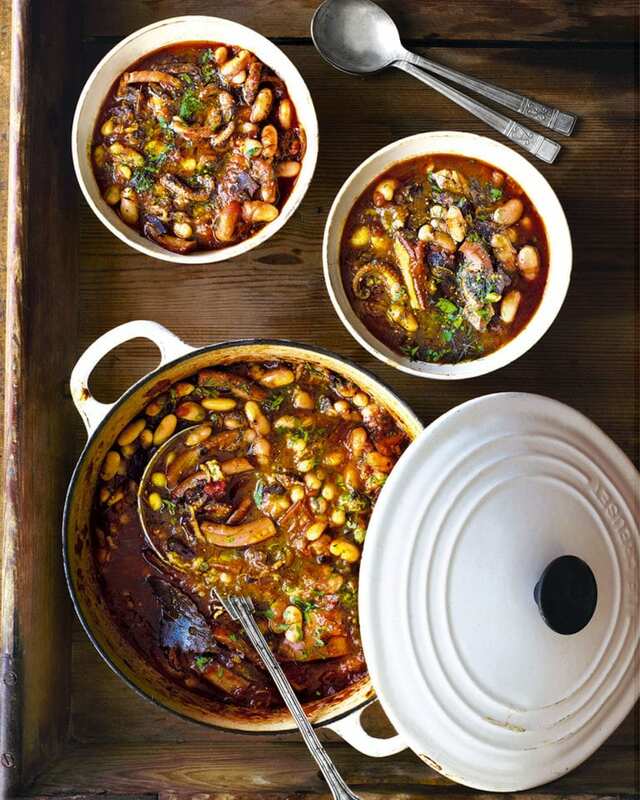 If you don’t have time to soak your beans overnight use a 400g tin of haricot beans. Stir the rinsed and drained beans into the squid stew for the final 30 minutes of the cooking time. You’ll need to soak the dried beans the night before (or see tip). Make the stew up to the end of step 5 up to 1 day ahead. Cool, then cover and chill. Reheat in a medium oven until piping hot, adding a splash more water if needed. Scatter over the fennel tops or parsley to serve. Buy fresh squid from fishmongers or at the fish counter in large supermarkets. It’s usually sold ready prepared – if not, see how to prepare a squid. If buying frozen squid, defrost in the fridge overnight. If you can’t find squid with tentacles, leave them out. If you go for a red, make it a light one like Italian marzemino or frappato, or a pinot noir. Best white here is soave.